Recently we featured a picture of Wast Water, taken by Dave Newton. 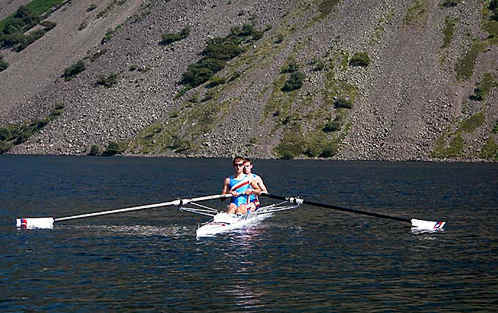 Dave had an arrangement, on that same day he took the picture, to meet rowers Rob McAllister and Rupert Merritt who were going to take their boat out on a training exercise in Wast Water as part of a training camp in Lakeland as preparation for entering the National Championships of Great Britain. Ever since we have been worrying that if this pair should become famous, then we will have missed a golden opportunity to name drop. Ill fated Donald Campbell in his boat Bluebird was killed on a nearby lake, Coniston Water, trying to break his own world water speed record. This looks much safer, and we wish Rob & Rupert the best of luck with their aspirations. American actor (1961- ). His father, Charles Voyde [shared name], has been convicted twice for committing paid murders. Once in 1968 and again in 1978 (for the murder of Federal Judge John Wood). His father, Charles, in addition to being a convicted felon, is believed to be one of 'the hobos' taken away from the area known as 'the grassy knoll' right after the shooting of President Kennedy on 22 November 1963. Nothing like a good start in life! Even his name might not help, but when you read where he got his break, we think you may remember him. Information on the IBDB (Internet Movie Database) web site was used in the preparation of this mini bio. Google answers for the search term "Wednesday 24 July 2002"
The Glacier Society aims to unite polar interest from around the world. The Google answer that caught our eye was a report by the Argentine navy that their icebreaker 'Almirante Iriziar' had become ice bound while trying to rescue a German research vessel 'Magdalena Oldendorff' that was trapped in an Antarctic ice field. All this and more on an interesting web site. We confess that we find Ann Robinson strangely compelling on the otherwise tedious quiz show Weakest Link, which we first watched only because we thought it was something to do with the web. The American version of the show now has a blander presenter after Ann was replaced, though we had no problem with her perceived rudeness, lack of sensitivity, and heavy sarcasm: presumably the target audience is made up solely of single people, which would account for the change. That BBC web page has lots of interesting links to other comedic practitioners, including a favorite of ours Caroline Aherne, who found national fame in the UK in 1994 with both The Fast Show and The Mrs. Merton Show, whose eponymous character was a sweet old lady who would ask the most outrageous, below the belt questions of her guest stars. "So, what attracted you to the millionaire Paul Daniels?" she famously asked of his stage assistant and partner 'the lovely' Debbie McGee. The most powerful venoms are usually delivered with little fuss. We understand the Aussies now benefit from Caroline's subtle writing for TV sitcoms. Finally we happenstanced upon Duck Flat Wooden Boats from Mount Barker, South Australia, whose oxymoronic (a word we just invented in the American tradition of turning nouns into adjectives) 'What's New Archive' has an entry, "We're all very excited about the new Mundoo II that we've recently designed." We actively enjoy the enthusiasm of people who take a modest pride in their achievements, and tarried a while checking out the Google entry, and the brochure we downloaded. A link from the Duck Flat site led us to the Institute of Backyard Studies, where we were introduced to the Meat, Metal, & Fire of Australian culture. We were relieved to discover that Blokes & Sheds is an international phenomenon.